In honor of Earth Day on April 22nd, the Daily Palette is celebrating earth-friendly art and literature all this week. We are honoring Iowa-connected artists and writers who show respect for our planet through their work. Regan Golden is an artist and critic based in Iowa City, IA. Recent exhibitions include Clear Cut at Gallery 44: Centre for Contemporary Photography in Toronto and Beginning Below Ground at Gallery Proper in St. Louis. Golden's work has been exhibited at Harvard University's Fisher Museum in Petersham, MA; Gallery 400 in Chicago, IL; The Walker Art Center Sculpture Garden in Minneapolis, MN; The Rochester Art Center in Rochester, MN; and The Cue Foundation in New York, NY. Fellowships include The Core Program at The Museum of Fine Arts Houston and The Stone Summer Theory Institute at The Art Institute of Chicago, as well as a Long-term Ecological Research Grant in the Arts from the National Science Foundation. Golden earned an M.F.A from the University of Wisconsin—Milwaukee and a B.A. from Grinnell College in Grinnell, IA. She is co-founder of the collaborative, Drawn Lots, and a frequent contributor to Temporary Art Review. "When I started photographing this forest in 2006, I believed that I could preserve the woods in pictures, but once the development began, that idea seemed naive and inadequate. To disrupt the continuity of these images and the illusion of an impenetrable forest that they produced, I cut into the photographs by hand using an x-acto knife following the contours of every form. The incised photographs are as much objects, as they are images, with each cut disrupting the illusion of space and revealing the materiality of the photograph itself. While it takes only a second to take the picture, it takes weeks to cut, and this process yields new information about the plants and trees in the forest that went unnoticed at first glance. Although this entire process strengthens my understanding of the place, it weakens the actual images. The cut photographs slowly fall apart mirroring the entropy and decay of the woods. 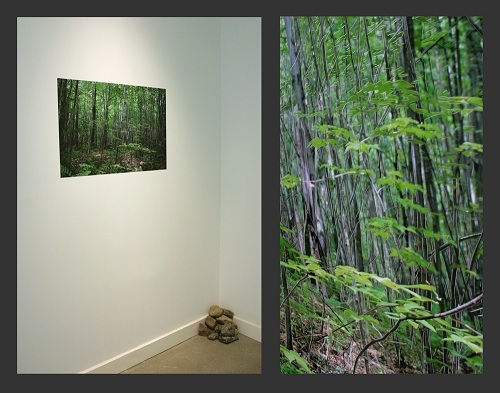 In this process, I find myself both complicit in and reacting against the destruction of the woods."